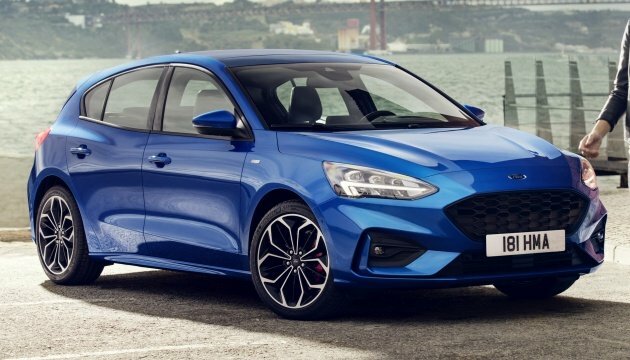 The wraps have officially come off the 2019 Ford Focus Mk4, which will initially go on sale in Europe and China this year before making its US debut sometime in the second quarter of 2019. On the continent, the fourth-gen C-segment hatchback will go up against a plethora of competitors, including the Volkswagen Golf Mk7.5, Renault Megane and Hyundai i30. The Focus will come in three body-styles, these being a five-door hatch, a five-door estate and a four-door sedan, the latter available only in selected markets. In total, there are six variants or trim levels available for the car, the line-up consisting of the Active, Ambiente, ST-Line, Titanium, Trend and Vignale, the last being the brand’s luxury trim level. 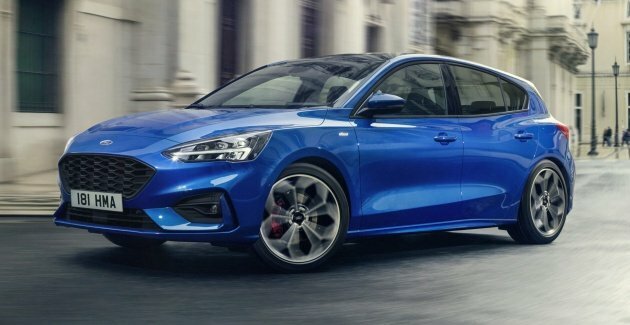 At point of introduction, the upmarket Vignale, sporty ST-Line (which lowers the ride by 10 mm), adventure-oriented Active (which increases the ride height by 30 mm) and upscale Titanium will be available for the European market, while the ST-Line and Titanium will be found on the car for its Chinese market debut. Underpinned by the brand’s C2 platform (which is an evolution of the C1 chassis used on previous iterations of the car and 20% stiffer in torsional rigidity), the new Focus looks bigger than the third-gen C346 upon first glance, but is actually not much larger than the old car dimensions-wise. The new five-door variant is marginally longer, a fraction wider and a shade lower than the outgoing car, measuring in at 4,378 mm long (+20 mm), 1,825 mm wide (+2 mm) and 1,455 tall (-29 mm). The wheelbase, however, has been increased by 53 mm and is now 2,701 mm long. The estate, meanwhile, is 4,668 mm long, has the same width as the five-door but is taller at 1,481 mm. The Mk4 also features a weight reduction of up to 88 kg, like-for-like, compared with the Mk3. Design-wise, it’s a blend of old world and new. The front, with its longer hood and more aggressively-styled bumper and bolder fenders, is an edgier reinterpretation of the Mk3 and helps the car remain unmistakably a Focus, and the new horizontally-biased headlights give the car a far keener look. Things get decidedly more generic from the sides on. While certainly flowier and showier than its predecessor, the chosen flow also masks the car’s immediate identity, especially from the rear. From beltline, side projections to tail lamps and rear contours, many of the depicted lines have a familiar ring to them. It’s not from just one particular avenue, as the more astute will have noticed, though large ‘Focus’ logotype lettering emblazoned on the tailgate takes the guesswork out of things. Such are the bounty of cues that there’s even a nod to a premium German brand in the shape of the exhaust finishers on the Vignale. Styling kit helps distinguish the variants to a large degree, the ST-Line getting a more aggressively-styled rear diffuser, larger functional roof-spoiler and more open front apertures, among other things. For the Vignale, there’s plenty of satin aluminium elements as well as a signature Vignale mesh grille, and going the Active route elevates the car’s ground clearance and adds on suitable off-road styled bits such as black protective wheel arches and rocker claddings and front/rear skid plates. Inside, the cabin has been totally revamped on the new car, and the presentation has become more refined and upscale through the adoption of high quality trim materials – Ford has said it was looking at moving the Focus up the luxe ladder with an emphasis on craftsmanship, and it looks to be very much the case. More soft-touch material makes its way on, and variants get differentiating trim combinations – on the Vignale, there’s fine-grain wood-effect finishes as well as premium leather, while sporty carbon fibre-effect trim and red stitching equip the ST-Line, and rugged, textured materials and surfaces can be found on the Active. The Mk4’s cabin will certainly be perceived as a big jump in the right direction for most buyers. The dashboard and centre console layout is a world away from that of the Mk3, which would best be described as bulky – revisions on the third-gen facelift resulted in improved ergonomics and logic aspects, but did very little for improving volume. Classicists might think the cleaner and more conventional layout to be too universal-looking, but the simplified form has plenty of function, removing much of the clutter and making things much easier on the eye. It also addresses the biggest issue concerning the Mk3, which was the lack of interior space. The revamp is significant where this is concerned, nowhere more so than at the back. Rear passengers get additional space – shoulder-room has been increased by nearly 61 mm and knee clearance and legroom has been improved by 51 mm and 71 mm respectively. Interior novelties include an electric parking brake and the adoption of a rotary dial gearshift, which frees up space and provide easier access to bins and cup holders. There’s also an eight-inch touchscreen SYNC 3 infotainment system, which is compatible with Apple CarPlay and Android Auto, as well as a wireless charging pad for mobile devices. Other available kit includes a 675 watt, 10-speaker B&O Play audio system and FordPass Connect embedded modem system, which turns the Focus into a mobile WiFi hotspot with connectivity for up to 10 devices. The latter also offers access to features such as a vehicle locator and remote start via the FordPass mobile app. Two EcoBoost petrol and two EcoBlue diesel engines will be offered for the Focus on the continent – the petrol units are a 1.0 litre EcoBoost that has been reengineered and is available in 85 PS, 100 PS and 125 PS output tunes, as well as the automaker’s new 1.5 litre three-cylinder EcoBoost unit (not the 1.5 seen on the current Focus, which is a four-cylinder unit), which will have 150 PS and 182 PS versions and includes tech such as cylinder deactivation. The two EcoBlue diesels are of the 1.5 litre and 2.0 litre variety, the all-new 1.5 litre oil burner coming in 95 PS and 120 PS output tunes (both with 300 Nm) and the 2.0 litre in a solitary 150 PS ad 370 Nm guise. 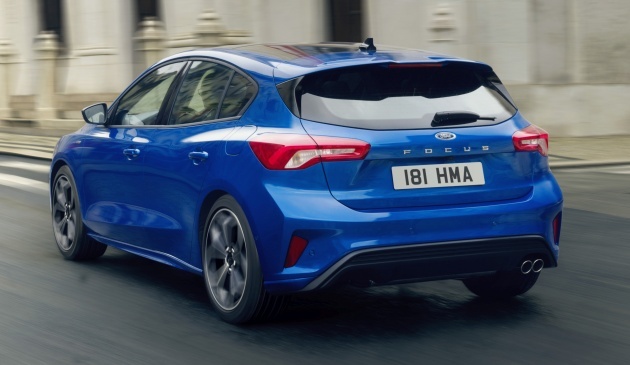 In terms of partnering transmissions, there are two, a six-speed manual and a new eight-speed automatic gearbox, which is available for the first time on the Focus. The unit is the 8F series for front-wheel drive applications, announced in 2011 and based on the nine-speed unit developed together with GM, with a gear omitted on this application. Available in two torque-dependent forms, the 8F24 should feature with the petrol units and the higher-rated 8F35 paired with the EcoBlue diesels. A raft of driver assist kit, grouped under the new Ford Co-Pilot360 suite, offers items such as Adaptive Cruise Control (ACC) with stop & go (a.k.a. low-speed follow), speed sign recognition and lane-centring, as well as Active Park Assist 2. which controls automatic gear selection, acceleration and braking, enabling fully-automated parking to be accomplished at the press of a button. Elsewhere, there’s Evasive Steering Assist, a segment-first technology that helps drivers steer around stopped or slower vehicles to help avoid collisions, and the Focus will also come with a head-up display, the first Ford model in Europe to offer the feature. The Focus Mk4 hatch and sedan for Asia. The Focus has always driven well, and the fourth-gen aims to continue that particular strength. Two rear suspension choices are available for the Mk4, the first being a double wishbone layout that optimises both comfort and the vehicle’s response to driver inputs. Models equipped with this layout can also be specified with a Continuously Controlled Damping (CCD) system, which monitors suspension, body, steering and braking inputs every two milliseconds and adjusts damping responses for outstanding ride quality. The CCD system also supports new drive modes (Normal, Sport and Eco). Seen for the first time on a Focus, it enables the characteristics of throttle pedal, the eight-speed gearbox and the electronic power-assisted steering (EPAS) to be tailored according to the setting. When equipped with CCD, two additional drive modes (Comfort and Eco-Comfort) are provided. The other configuration is a twist-beam layout, which the company says has been designed to complement the lighter 1.0 litre EcoBoost and 1.5 litre EcoBlue powertrains. 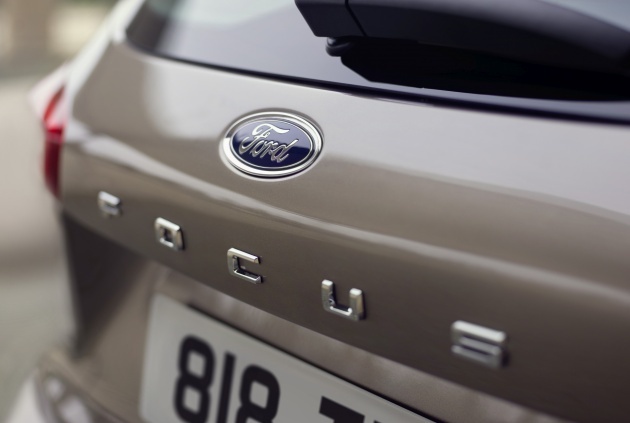 The Focus also debuts a bespoke, in-house developed Ford stability control system tailored to support Ford lvels of driving dynamics. It also comes with torque vectoring control. A palette of 13 exterior colours has been announced for the Focus Mk4, and available shades include Orange Glow, Desert Island Blue, Race Red and a Vignale-exclusive four-coat shade called Dark Mulberry. 2018 Ford Focus B-Roll from Paul Tan Automotive News on Vimeo. The King is back again! The Focus need to focus to catch ASEAN market. Otherwise, the fate will be continued like previous model. well represented by the truck but i guess Fiesta sales would also be low since the model has aged. Those headlamp design looks very fussy. I think Ford is going for the Volvo Thor’s Hammer look but it fails to be as elegant. Ford & VolvoCar berpisah tiada. This vehicle adds to my long, personal list of ugly cars of 2018. The rear is decent, but the front… it’s ugly. The new Ford design looks absurd and ugly . civic 1.5 turbo also develop about that same power even though it’s an older model. European market vehicles aren’t solely focused on power; often having to detune outputs to meet emissions standards. that’s being said the 1.5 mill here (which is already in the current Focus) is actually older than the Civic..still, it puts out 182 horses vs 173 in a civic and more torque. but will malaysian except the estate version?? i dont think so since most malaysian will prefer SUV instead..
Expect SD to screw up the local line up and pricing as usual. When you are a GLC with no intent on making profits, it does not matter what buyers want. U referring to record breaking GLC Honda MY ke? Nice… Please bring in the 1.5 Ecoboost + 8speed auto..
Heard over the news that all new Ford Focus will be made in China .